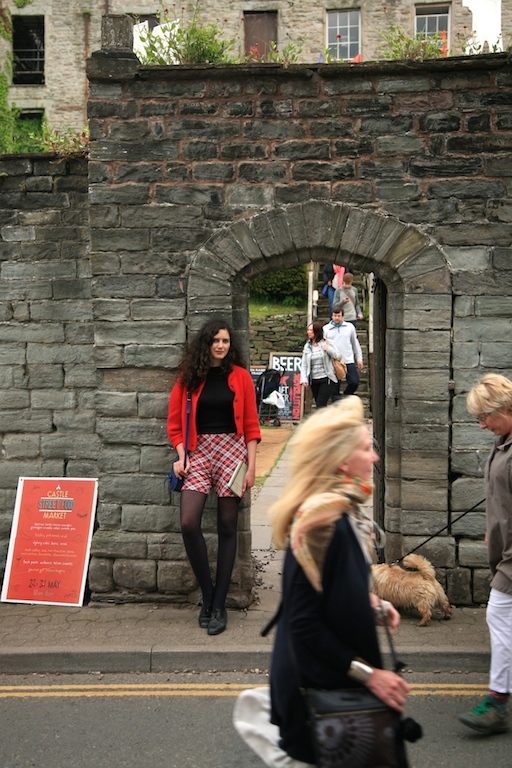 The week before last I went to Hay-on-Wye, dropping in for an afternoon interlude at the literary festival. It was much too short an immersion, time only for a coffee, some book browsing, a single event, and a smattering of aimless wandering. The town was a-buzz; pavements crowded and queues everywhere. There’s something intriguing in observing a place you know well - briefly transformed, quiet streets suddenly full of racket. I also had chance to meet the completely wonderful Louise O’Neill, author of Only Ever Yours (see my review here). We sat down for a quick talk, ranging over areas from Instagram to books to beauty standards. We both commented on how we already felt like we knew each other – Twitter providing a platform for conversation long before any face-to-face chats. She’s about the fifth amazing woman I’ve met through social media within the last month. The modern world is wonderful, isn’t it? Weird and odd and great, all at the same time. I left Hay that evening feeling so utterly content. It did what so many exciting things do, whether it’s an event, a lecture, a two-way conversation, or a collection of poems. I relish anything that heightens my enthusiasm – reinvigorating and stimulating an idea, perhaps, or an ongoing piece of work, or a thought still buzzing with potential. There’s a sense that one could go and do anything: write something, create/make/ work and craft, or think and learn. We need those touchstone moments. They’re not so much grounding as elevating, a necessary form of uplift occasionally required when things are feeling bogged down. Hay also felt like a temporary shrugging off of responsibility, real life ebbing for half a day. When have I had similar feelings since? At a barbecue in the park where we waited to watch the sun set over the buttercups. While drinking cold white wine in the burning heat, sitting on a sofa in a friend’s garden. During the weekend just gone, full of books, conversation, and bouts of slipping in and out of the river in my bikini - stretching and kicking and breathing (and avoiding the odd boat). Each morning as I make breakfast, brew coffee and spend half an hour reading Women in Clothes. An equal mix of social encounters and solitude. Various things have been a struggle recently, requiring me to acknowledge my own vulnerabilities and limitations. But when anything feels less manageable, I always try to bring myself back into these small, significant experiences and ways of treating myself well. They are what remain important. So much of the time we focus on work and achievement, forgetting the necessity of all the good stuff - of friends, family, lovers, food, long phone calls, whisky, a coffee in a café, reading a book because it’s enriching, writing something for oneself because it’s stimulating and full of possibility, listening to someone who needs an open ear. Of going for a day trip, taking a walk, dancing until knees ache, listening to fantastic music, having fizzy conversations that make you dizzily content, sleeping in when the sun is reaching through the curtains, getting up early and cycling through near-empty streets, beginning a new project just because you can. Of wearing a damn good outfit and several layers of red lipstick, buying things you don’t need at car boot sales because they’re simply too pretty, trawling charity shops all afternoon, talking to strangers on occasion, or enjoying your lonesomeness at others. Then there’s the pursuing of thrilling opportunities and new quests and intellectual challenges – perhaps pursuing in the knowledge that it will not necessarily be easy, but will certainly be satisfying in the end. You just have to recognize that as you work through things from hour to hour, day to day, some of those hours and days will be glorious and glittering, while others may prove really quite tough. I guess it has to be a specific kind of pursuing too, one tempered by the recognition that you are not solely the worth of your GCSE grades, your A-level results, your university degree, your inbox, your income, your work-life, your online image, your looks, your desirability, your status. You can absolutely and utterly be bloody proud of any of those things, if you so wish. I am, with various things on that list. But for years some of those achievements were the only way I defined my worth – becoming a singular measure, rather than a set of contributing factors to an overall sense of self. Hopefully the equilibrium is a little more balanced now. I spent this evening cooking a curry for myself, drinking red wine, and working out what I needed to complete before the end of the week. I took it moment by moment. Now I’m off to dig my nose into a book before bed. It’s taking time, but I’m getting there with each little anchor back in the present, each instance that lifts the day. 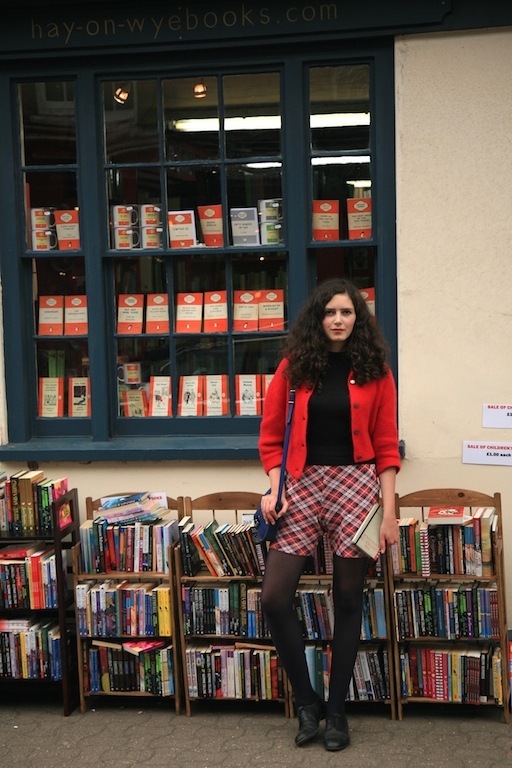 While in Hay I wore the most fabulous vintage tartan shorts I'd picked up the previous day in a charity shop for £4 - here combined with a second hand polo neck, a cardigan that belonged to my great grandma, and shoes from a charity shop. The notebook was bought on the day, and has now become the place for all my poetry scribblings and general notes. 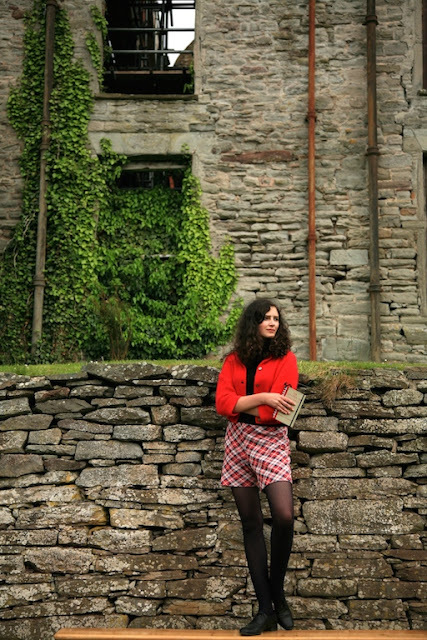 Those tartan shorts are such a treasure, it's totally obvious they are vintage, they just don't make stuff like that anymore...and my, your legs look endless in them! Such a fantastic look...and what a lovely location to match. I do agree with you that those little moments are extremely important. We are so much more than a sum of things to be written in a CV or the amount that we earn per month. There is nothing wrong in being driver, but we must never forget to live! Today I enjoyed meeting one fashion blogger in person (the second so far) and it was a wonderful experience. It is really great to meet someone with whom we already have so many things to talk about, isn't it? It's like meeting somebody you already know! Great post and so true. We need to appreciate the moments in life - while we are in them! You look lovely here. The pictures are beautfiul. A lovely life affirming post. I've spent the morning buying pretty things I didn't need at the car boot, an afternoon in the sunshine with a great (secondhand) book and am now swigging a beer from the bottle, enjoying a massive blog catch up, whilst last night's curry heats up. Life is for living and enjoying the moment. Too many people spend it capturing it on a phone and sharing it on Instagram. PS: I have a new post on my blog. What lovely shorts - Ivana is right, your legs do look endless in them! It's always nice to have a potter around (especially charity shops) and do some 'life admin' - sorting things out at your own leisurely pace. This post rings so true. So often I find myself having a good time, and then having anxiety over it because I want to hold on to it. I need to remember to just enjoy things while they last instead of thinking about how long they'll last for. It's a really easy thing to forget because it's such an ignorable cliché; pictures of sunsets or butterflies with quotes about finding yourself and living in the moment make me want to roll my eyes, even though there's truth to what they say. Hay Festival sounds wonderful, and I love what you wore and the photos from the day (especially those pictures of you in/beside the bookstore - you look right at home!) AND THOSE SHORTS. AHHH. They're fab. Also, do I spy a side-part? It really suits you. ...Great posts below. Those pictures of you in the silver dress are stunning. And HUGE happy birthday to you for last month! P.S. I was rereading your General Election post (I've read it many times now, I find it really motivating), and then I reread my comment, and noticed an error that I just HAD to correct: Larissa Waters and Scott Ludlam did not replace Christine Milne, for they are co-deputy leaders of the greens, whereas she was leader, and was replaced by Richard di Natale. I knew that, but I somehow managed to mess it up in my comment. Sorry, I know it's probably not something you care about, but for my own selfish needs I had to correct myself! I'm so jealous Louise O'Neill got to meet you in person! I so wanted to go over to Europe this spring, and then I got knocked up (again) and other expenses came into consideration. I still have a fantasy of renting an apartment in Paris and spending the summer there with the kids not too long from now. Not too much of a fantasy, though! Paris is overflowing with helpful family members on my dad's side, and I have my EU passport. If I go next year, at least one of my kid's can still fly for free! See?? It makes economic sense! Maybe we still will have that chance to meet. In a year or so...sigh. I love catching up on your blog. You have such an infectious enthusiasm for life and art and beautiful; you beautifully convey it through your writing, and you make me feel newly excited about my own work despite the challenges of writing while mommying.